If you are making things for tapered glasses, mugs or whatever, here is a web site that will give you the correct shape you need to make it look right. A few measurements put into the easy to understand questions and it will give you a PDF that you can copy and paste into your design software. I have tried it and it works perfect. This is for instructional purposes only! Using the template I got from that website, I used corel draw and the envelope tool to create the shape of the logo. As you can see, it is a messed up looking thing. I cut the vinyl and masked for the sandblaster. As you can see, the logo "looks" to be square on the glass. Kind of wonder what it would have looked like without the distortion. Guessing not good. Can't sell them, but wanted to use something simple for the experiment. One day I plan to go through the process you linked to above. For the last few years, and using the same 16 oz. glass with an approx. 2.25" wide design I find a 2* distortion works pretty good. A circular design now - that is a different animal to get it looking good. I have done a few and pretty much have to relearn the process each time. I think it would have been a sad bowtie. Not exactly sure. You could very well be right. Ya, I think you are right! But you do have to figure out the % of coverage. The glass had an average circumference of 10", so you have to figure out the width of it and adjust to the % of coverage you need depending on the height. As in, if the graphic is 1" tall and 5" wide, it would be 1" high and 50%. If you dropped it to 1/2" high and 2 1/2" wide it would be 25% coverage. Clear as mud, but it does work very well. My glass was 3.35 dia 1" down from the top rim. 1" down from that (height of graphic) was 3.055 dia. So, 10.52 circumference at top of graphic. 9.6 circumference at bottom of graphic. I also use a fine tip sharpie to mark the glass and also mark the vinyl at the distance from rim to top of the graphic to line it up. That warped graphic stuff is not easy to line up by eye. Personally I prefer 25%-30% coverage. Anything much larger than that and you can no longer see the full image without rotating the glass. I agree 100%. 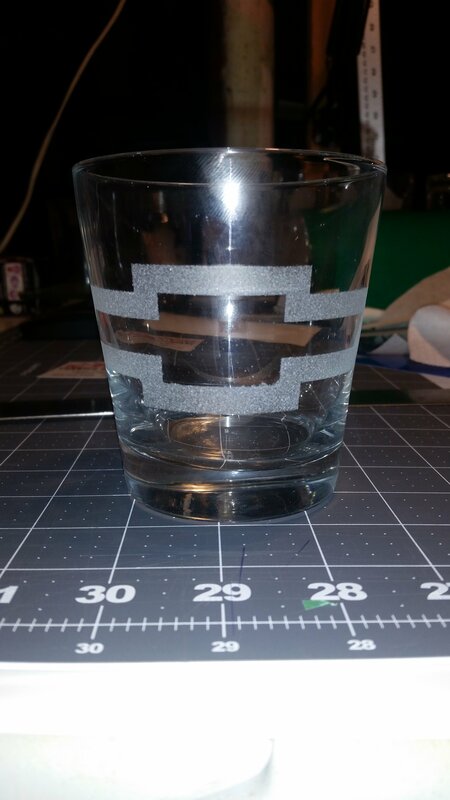 It was my first attempt at the tapered glasses and figured the larger size would show me the template was in fact right. I do know that every time I put my glass down it gets a bit turned. So after a full drink you get the time lapse panoramic view. LOL! Mike, if you are going to get into this and do a bunch of glassware - rather than measuring the glass and marking it, I determine the center of the design and the centered height to where on the glass I want it placed. Then if there is a 1-2" space above the design I simply cut my decal out with a 1-2" margin above the top. Then I just apply the decal with the top edge of the decal even with the rim of the glass. Clear as mud? As a quick example, the design is 2" tall and I want centered 3.5" from the top. 3.5" to center of glass minus 1" center of decal = a sandblast decal with a 2.5" margin at the top. Side and lower margins are unimportant as they will be taped off anyhow. The 2.5" top margin aligns with the rim of the glass where I start when I apply the decal. I get what you are saying. Now, if the taper changes, you need to re calculate that 2% right? Don't know AI or how that handles the tapered stuff. I just know corel and find this template this very handy and easy to work with. I am sure we are just messing up the ones that have never worked with tapered stuff. The math part is not as bad as looking at the design and knowing in your mind this is just not going to work. It does, but it looks so weird that you think there is no way. You are correct that if the taper is different the arch would different. Now, will your program calculate for a wine glass? Curves instead of straight tapers? I have so far drawn the line and for the most part stayed away from curved stuff. No wine glass option. I am trying to stay away from them. Probably have to work on it at some point, but not looking forward to it. I think you just make do on wine glasses, there's no easy way to do stuff on curves. And once they drink enough of the wine the image will look just fine. Something else to keep in mind for glasses, aside from accounting for the cone shape, you might also want/need to account for the cylinder shape. Meaning once you account for the cone and get things straight, if you want to put say a square on the glass, and see the whole square when you look at it straight on, it will appear as a rectangle. Most designs it's not an issue, but every now and then you'll have something that just doesn't look quite right. Here is a thread discussing this as well as the math I came up with to account for it. I wonder if the template from the link in the first post takes that into consideration? Have to experiment a bit more. I have not run into this on squares, I do not think I have done any work that involved a square or frame around the work on glassware. Designs that have been close to that, however, were ok when the arch was applied. Now a circle on the other hand - is tougher to get to that "just right point" where it still "looks to be a circle. I learned that the hard way when I did a Yeti mug for my SIL. I think it looks pretty gosh awful - but she is happy with it and uses it everyday. I cringe every time I see it! On second thought - I guess I don't cringe so bad that I would go out and buy her a new Yeti Probably should, might be better advertising than what she carries around now! No, the template from the link only accounts for the cone shape and ensures that what ever you put on it comes out looking straight. The distortion I'm referring to is from the fact that when you look at the image, the edges curve away from you giving the appearance that the image is not as wide as designed. You don't notice it on most designs, but things like circles that the mind knows is suppose to be symmetric in all directions will jump out as Cal mentioned. In order to get a circle to appear correct you have to start with an oval that is wider than tall, then put it on your template. The math I came up with is for a cylinder, but it should be close enough for most cups/glasses. Got the math done, now I have to figure out how I am going to show it and not make it crazy stupid to figure out. Should work with strait or tapered glasses. Here's what I came up with, I worked it so the original image width says the same and the height is adjusted to account for the distortion. This is written in the sequence you would put into the windows calculator. Let’s say you are putting a graphic on a beer mug with no taper. The beer mug has a dia of 3 inches. Then .3 X 9.42 will give you 2.83. That will be the width of your design. Scale you design (height and width locked) to that width and save that number. That unfortunately will give you a design that looks taller (or narrower) than you want. To fix that, we can figure out what the design should be changed to. You need to divide your angle by 2 giving you 54. In the windows scientific calculator punch this in. 54sin X 3 That will give you 2.42. That is what the design will actually look like for width. So, take your first number and subtract the second number. Subtract 14.5% from the height of your design without changing the width. Close to what darcshadow said with way more detail that may not be needed. You can change your numbers (dia and% of coverage) to reflect what you are actually designing. Couple of comments. You start out by multiplying by 360 then dividing by 360, you could have just started with 0.3, which is the same as 30%. You do need the angle so 360*.3 is necessary at some point. sin(angle) * Diameter, I agree gives you the apparent width of the design. But unless your design is a square you will need to do some division and multiplaction, not simple subtraction. The first part was to help people that are not so good at math get the angle and the ".3"
I did say I was going to keep it simple. The height should not matter the way I did it as long as you subtract the final number from the height leaving the width the same. I don't know if there is even a way to prove what is right. Illusions are pretty hard to calculate. When I get the time, I am going to try both ways and see how they look. The problem with just subtracting is it is only correct if your design has equal height and width. If for example the design in your example was only 0.41" tall to start with now it's height is 0. The correct height for the new width should be 0.35. You need to shrink the height by the same percentage as the apparent width shrank. So in your example the actual width is 2.83, the perceived width is 2.42 so that a change of 85.5%. So shrink the height by the same percentage and the image should then look correctly, when viewed straight on. So I just need to change the last part so it is a percentage instead of a distance. Makes sense. Then we can rewrite it so it is simple for anyone to calculate.